Vandals who broke into Van Nuys Airport on Sunday night covered three different multi-million-dollar corporate jets with graffiti –- the second such incident at the Los Angeles area airfield in the past two years. Two of the jets were in a large hangar in a secure area of the airport. Authorities believe the suspect or suspects cut a hole in the perimeter fence and entered the airport late Sunday night or early Monday morning. Preliminary damage estimates ranged from tens of thousands of dollars to potentially more than a million dollars, depending on the extent of the damage to the exterior paint of the planes. The aircraft belong to Fair Wind Air Charter, Private Air Inc. and Aerojet Services LLC, according to law enforcement and aviation sources. "This happened in a darkened area of the airport," said Los Angeles Airport Police Chief Patrick Gannon said. "We are going to take a harder look at the lighting in the areas where this happened." 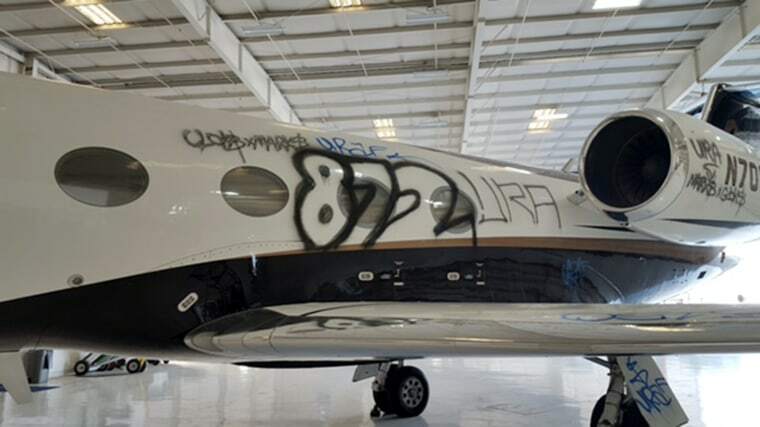 Two years ago, a $2.3-million Learjet suffered $100,000 in damage after being spray-painted with graffiti in a secure area of the same airport. The LAPD said at the time that the crime was gang-related but no one was arrested. The Learjet, which was vandalized with black spray paint spelling out "Flame" and "R.I.P. ", was parked in an overflow area of the tarmac. Van Nuys Airport is one of the nation's largest general aviation airports and airport officials have said they have discussed strategies to prevent such incidents. Airport officials did not immediately respond to a request for comment on the vandalism, but have previously said that security and police officers, aircraft operators, private owners and residents all have a role to play in being vigilant and reporting suspicious activity. The Los Angeles Airport Peace Officers Association (LAAPOA), the union representing the officers who patrol Van Nuys and other area airports, says additional officers are needed to keep it safe. LAAPOA President Marshall McClain noted that despite a barbed-wire fence a mentally ill man had accessed a restricted area at Los Angeles International Airport on Christmas Day. He said the Van Nuys and LAX perimeter breaches support his organization's calls for increased patrols of "highly vulnerable targets." L.A. Airport Police Chief Gannon told NBC News that airport management has expressed a willingness to hire and will fill all vacancies with qualified officers.